I have been researching the Boxster for a year or so now. For my budget and wants, I was after a silver 99 base in good shape, with low miles at a reasonable price. 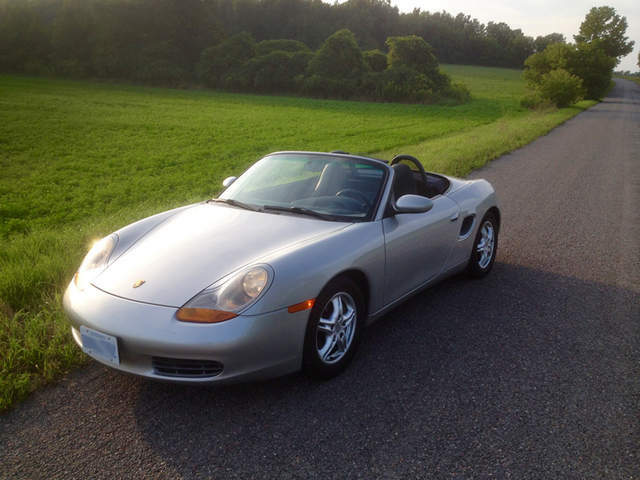 On Monday the 17th of August, 2015 I brought home my new-to-me Boxster. I got the 1999 silver with 56,000 klms on it for just under $14,000 Canadian dollars. It is still tight like new and I am lining up things to update and preventive maintenance thing. I want to thank all the folks on this site for the mountain of info that helped me make this possible. I live out in rural Ontario where the roads are hill and dale and are always open. Perfect car for the area. Jealous about your roads - just highways and boulevards in my day to day. Ha! Yes the weather in a few months will not have any joy in it. While you guys are still driving around, I will be shoveling my driveway. I will put her away for the winter and look forward to April. That's a beautiful example of the breed you found, obviously a garage kept & winter stored toy in fabulous condition. I must agree, rural Ontario is very beautiful this time of the year as Giller & I are discovering. I miss those roads. Driving through Prince Edward County in particular. Ontario's hidden gem. Nice looking car BTW. Paul, I drove through Manitoba many times as a teen in about 77'-79'. If I recall there is a curve somewhere on the TransCanada. I remember it kinda taking me by surprise after mind numbing hrs of straight-to-the-horizon driving. Is it still there? All kidding aside, North of the 401 has far better roads than the PE County. But the restaurants are better down in the county.